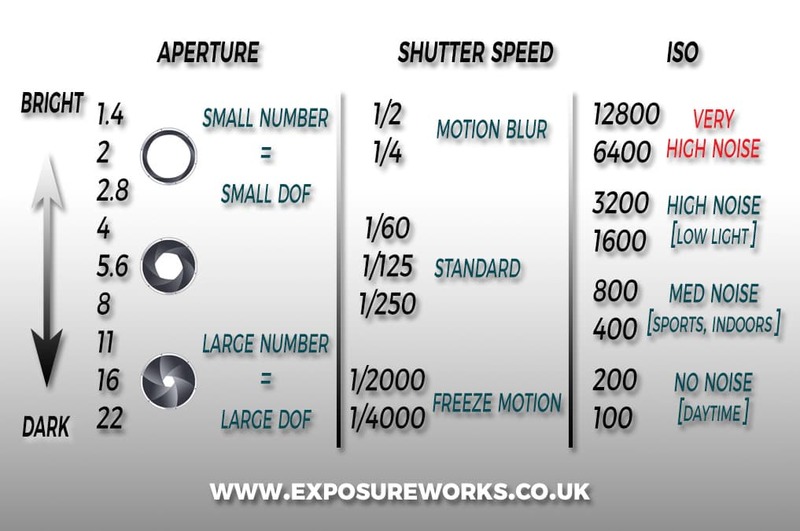 Exposure depends on four variables: light, aperture, shutter speed and ISO. 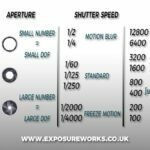 The ExposureWorks sticker helps you visualize the relationship between the three variables that you set up in your camera. The numbers towards the top make the images brighter, the numbers towards the bottom make the image darker. Just keep in mind: photography is not about the numbers. But you need them to take creative control of your camera. Work towards associating numbers with the creative effect they will have on your images: shutter speeds give you motion blur (blur in time), aperture determines depth-of-field (blur in space). The graphs below illustrate the balance between shutter speeds and apertures.